That explains why it was affecting me too. I often open multiple tabs on this site too. Out of curiosity, does the site get enough traffic to need that sort of throttling, or is it just relative versus hardware limits? We get a lot of traffic. I have just dropped four figures on a new server configuration. The summer months are lighter and fortunately we're passing some of the strain over to Vimeo and SoundCloud these days as well. We're currently assessing any outstanding issues but *hopefully* we shouldn't need any more changes doing. We'll be offline again for a few hours tomorrow morning (Saturday, 1st August) as the server software upgrades that were missed yesterday are implemented. Doing the usual round of checks, but that should be it . The operating system, server and SQL software have had major upgrades. We changed the database format to be more efficient. We're now running on several multi-terabyte drives in a RAID 10 configuration. The Yoggie coffers are now officially empty. Much time, effort and a four-figure rebuild for what essentially looks like no change at all (except we may appear a little "zippier" than before), however it does mean we're still here and in a good position for any future front end upgrades in 2016. Thanks again for your patience and understanding while getting all this sorted out (and also to @trevlix and @allicorn for their sterling work). If you still find any outstanding issues, do let us know. Yoggie's primary site software has had its life extended through 2016 which means we won't be forced to upgrade in the New Year. This allows us increased time to evaluate the maturity of the next platform (a good thing). We've pencilled in the weekend of 2nd-3rd June for our next major site upgrade. Look out for confirmation nearer the time either here (or via @YSDC on Twitter). Think of it as a "weekend off" for Olde Yoggie (though in reality, not, from a behind-the-scenes point of view). Just a reminder that a site update/upgrade is planned for this weekend (2nd-3rd June). Apologies for the inconvenience but it's essential work. When we're back new registrations should also be open again. Trouble signing back in? Use the "Forgot your Password?" option in the login box to reset. Also try logging in on a different device (desktop/mobile) to see if that's an initial issue. If you had a separate login username and display name - this has now been converted. Your Display Name is now your login. Not receiving a password reset email? It goes to your account email address. Is that your current email address? Also check spam filters etc. Currently inactive: The Keep, Players' Directory. New registrations are open again. "Contact us" web form is also back. We now accept Credit Cards, Apple Pay/Google Pay and PayPal. The should be a much better "mobile" (phone/tablet) view of the web site. You can now add cover photos to your profile. When people hover their mouse over your avatar they will see it. Cookie info. bar appearing at bottom of site. Read and/or dismiss it. New Features: include "Drag 'n Drop" file attachment uploads and you can now simply type @PoC for example to mention/link to a profile. There's also an updated YSDC Patron subscription page if you fancy signing up. Finding new content: is.... different... See the [Activity] tab at the top of the site. I'm looking into creating some sort of straightforward "New Posts" button as well. Meanwhile the [Activity] tab and its sub-menus cover quite a lot of ground (and the settings are customisable & saveable). I would like to give a shoutout to my two fellow admins, @allicorn and @trevlix for their fantastic work these past few days. Without them I wouldn't be able to type this now. Thank you gentlemen! We've still got some work to do, but we're open and still online some two decades on! We very much appreciate you staying with us, and making Yog-Sothoth what it is. Paul, an amazingly splendid update. Quite incredible, my sign up from fifteen years ago allowed me back in (with a password change). I’m going to have a good look around in the morning. Wonderful! I can get back to not working at work. 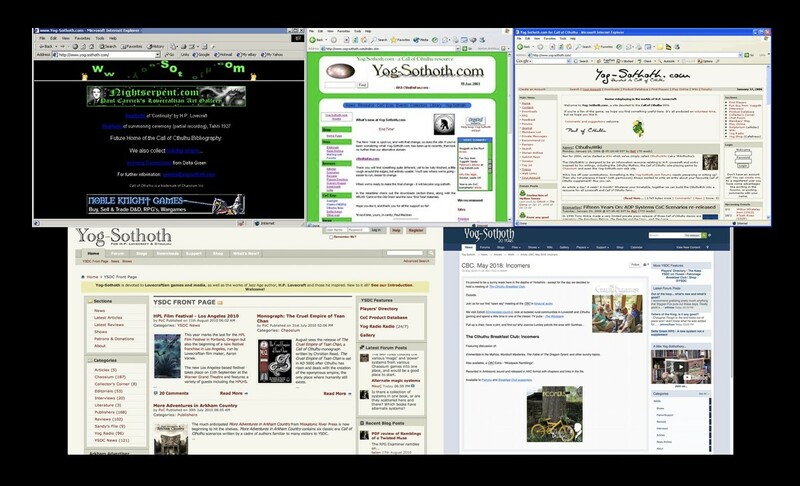 At some point we should really crowdfund for you to write a history of Old Yoggie and its associated everythings. First actual play podcast, loads of podcasts in general, long-lived massive and incredibly polite forums, convention, things that happen because of people meeting here, Masks Companion, in-house publications... there's a lot going on here. Quite incredible, my sign up from fifteen years ago allowed me back in (with a password change). Thank you @Robbie! (Robbie was the first YSDC coder and admin after me, having created (much better) incarnations of the Players' Directory and Collectors' Database than I did. ... there's a lot going on here. I am truly grateful I don't do this alone! AHHHH! The green!!! SAN loss 1d4/1d6!!! It wasn't easy, being green. Hmm, every time I log off (or get logged off), it won't accept my password despite being correctly imputed. So need to change my password every time I want to log on. Love the new look though. Nice job and great to see old Yoggie back with us! It looks to be a default software setting i'm glad you managed to wrangle it though!. Thanks Lee. There's still a lot to do, which will take a little while but we're getting on with it. The site loads faster, well done to all who enabled this to happen. New site looks great, Paul. No issues with logging in either (phew!). I had to login afresh on my iPad this morning, but maybe I didn't tick "remember me" last night. Both my iPod touch and Mac Mini have stayed logged in so far.